Q&A: What does Bombardier-Airbus deal mean for Belfast? 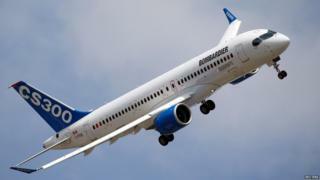 European aerospace firm Airbus is to take a majority stake in Bombardier's C-Series jet project. Bombardier has faced a series of problems over the plane, most recently a trade dispute with rivals Boeing that resulted in the US imposing a 300% import tariff. What does the Bombardier-Airbus deal mean for Belfast - and where does it leave Bombardier's spat with Boeing? Is this the win-win deal it appears? In the here and now, it seems yes. Airbus got 50.01% of something for nothing - and it did not even have to stump up towards huge development costs which nearly bankrupted Bombardier. In teaming up with Airbus, the future of the C-Series seems much brighter for Bombardier. Even before the US tariff case, orders for the C-Series were proving a tough challenge. They have been more-or-less static around the 360 mark for over a year. Airbus will bring financial clout and sales muscle in markets like China, where the C-Series is interesting a number of airlines. Some industry analysts predict Airbus may ultimately take entire ownership of the C-Series in years to come - buying out stakes held by Bombardier (30%) and Quebec (20%). Where does the deal leave the US tariff issue? On the face of it, the deal changes nothing. The case, probably due to be adjudicated on in February, still rests on whether Boeing suffered any harm when Bombardier did a cut-price deal with airline Delta to win a major C-Series order. Boeing has reacted with hostility to the Airbus-Bombardier tie-up. It is hard to see it dropping its complaint and it could be argued in an era of US protectionism the stakes have been raised significantly. The idea that the C-Series could now be assembled in Alabama, where Airbus has a facility, thus avoiding US tariffs, is intriguing but it may not be that straightforward if it is viewed as a mechanism simply to avoid tariffs. How secure are Bombardier's jobs in Belfast? In the short term, this is good news. The more secure the C-Series, then the safer the jobs in Belfast. There are some suggestions Airbus could even use wing production techniques in Northern Ireland for its own aircraft, as well as the C-Series. But equally, Airbus has its own wing plant in Wales, so is that a risk to Belfast? These are questions for much further down the line. It is also worth remembering the deal only directly relates to the quarter of the 4,000 workforce engaged in C-Series wings. The remaining employees work on other Bombardier aircraft programmes and some of that work has already been siphoned off to sister plants like that in Morocco, where production costs are cheaper. So other anxieties are still there. What does this say about the relationship between the world's big aerospace companies? Boeing and Airbus are the gorillas of the aerospace market, which includes two other relative minnows, Bombardier of Canada and Embraer of Brazil. There is no love lost between Boeing and Airbus, whose aircraft ranges directly compete with each other. Boeing is said to have long regrets about not being more aggressive against financial assistance to its European rival. Indeed, Boeing's competition case against Bombardier is in some ways seen as trying to curtail the Canadian's firm's growth - something it feels it should have done with Airbus 40 years ago. Off the back of the Airbus-Bombardier deal, there is speculation of a fuller partnership between Boeing and Embraer. They already have collaboration agreements.